Gravity Flip comes to us from independent developer ThaiBro Game Studio. This iOS game is about a programmer who gets fired for making one little mistake. His out of touch boss is angry, and mean. It makes me wonder if Gravity Flip is written about what it is like to be a programmer at a bank. Like one of the first banks in Tennessee or something. So this poor little guy starts talking to himself. His wind requires he makes it through these levels collecting stars. Once he collects enough he is free. Easy peasy right? Err umm no. Players must shift gravity while they avoid nasty things like spikes. And they have to share the same floor space as the door. Just getting there is not enough. Gravity Flip uses all on screen controls. This is one of those apps that is giving me the puppy dog eyes while it asks for a controller. 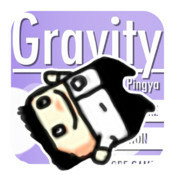 Gravity Flip would be a good game on the Nintendo DSi, maybe even on the Playstation Vita too. Oh and before I forget the Nintendo 3DS. I hope it is ported over to one of those. The graphics in Gravity Flip are clinical. Lots of light colors like white used in various place. This is not bad. The music sounds really weird at first, but after a couple of levels I started digging it. I found myself jamming while trying to avoid the spikes. The music alone kept me replaying longer than I normally would. There are concepts in Gravity Flip that are difficult in application. Moving and switching gravity at the same time can be a chore. At times the game liked to double the gravity which always ended in my characters untimely demise. Then I felt horrible that he was stuck in his mind for all time. This is where I point back to the controller - and not on screen.